Image Size: 19.5" x 15"
Paper Size: 23.5" x 20"
PT Boats fought in all theaters of Naval Combat Operations during WWII - but perhaps nowhere were they more suited to the environment than in the island-studded tropical SW Pacific. On December 27, 1943, PT-190 and PT-191 were attacked by fighter and dive-bomber elements as they made their way back to their base at Dreger Harbor, on New Guinea. The Imperial Japanese navy, totaling approximately 28 aircraft, surprised the PT's as they were crossing the open stretch of water between New Britain and New Guinea known as the Vitiaz Strait. 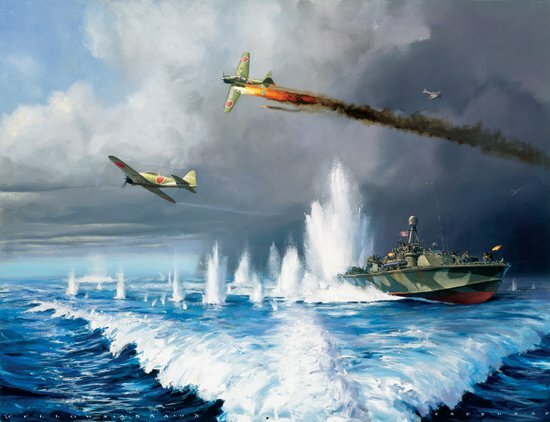 This print depicts PT boats being attacked by Japanese Aircraft on December 27, 1943 as they were crossing the open stretch of water between New Britain & New Guinea.